Gardening may not be your hobby. However, at our house we seem to have endless rhubarb. This stuff is hearty and gigantic. Truly you might think we were growing pumpkins if it were the season. So what is a lady to do with endless stalks of vibrant rhubarb? Bake cakes of course. Rhubarb cake is the perfect blend of sweet and sour. 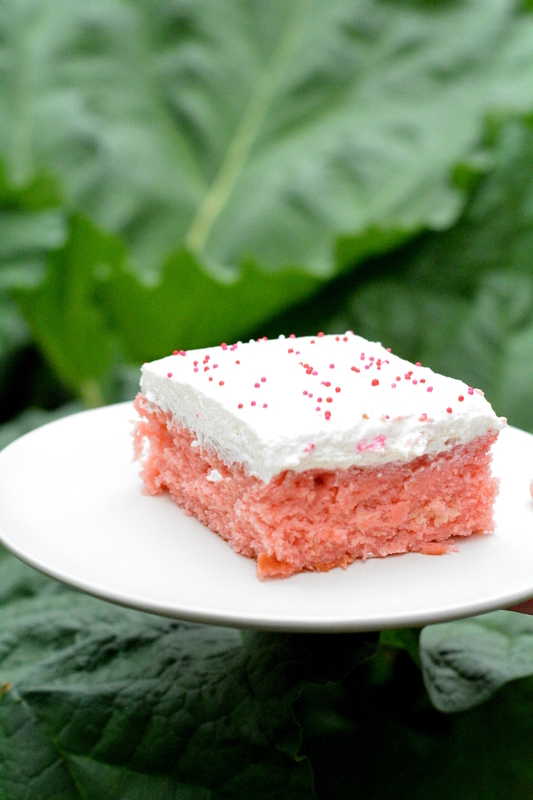 Rhubarb is not so traditional in cakes. There is the ultimate pairing of strawberries and rhubarb. A plant so hearty that plural is not necessary. As if you could eat more than one rhubarb. Rhubarbs is just not happening. So, when faced with an epidemic of sour vegetables, we decide to chop them down. Since pie is already perfected, we chose cake. I doubt anyone has offered you a slice of rhubarb cake before. After all rhubarb is healthy and vibrant pink. 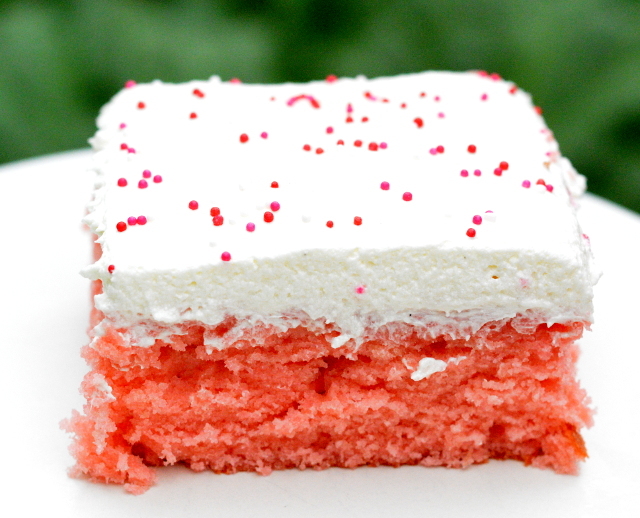 There is nothing more impressive than a slab of bright pink cake. 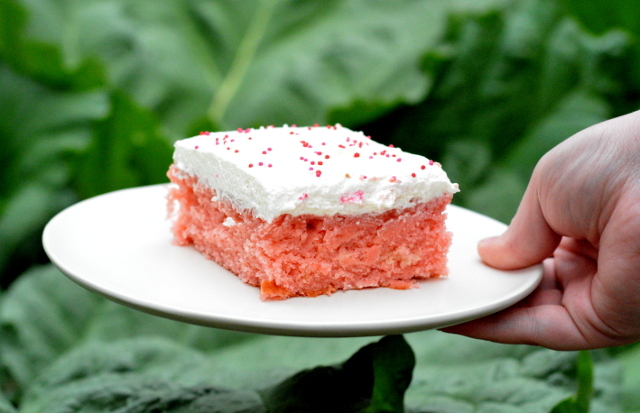 This is the stuff you wanted at your princess tea party because it is perfectly pink. As well as sounding sophisticated on account of the rhubarb all in delicate cake form. There is a tiny cheat though adding some pink food coloring. Whenever you are using natural plant based colors, they always lose some vibrancy from mixing. It’s hard to win against bright yellow egg yolks plus the bleached white of cake flour. Leaving out the food coloring and this will be a soft pastel pink beauty. I nearly paired this with a cream cheese frosting. However, I chose a vanilla Italian buttercream instead. There is nothing more pleasing than a fluffy layer of buttercream. The sprinkles were a last minute topping. Obviously, there is never a wrong time for sprinkles on frosting. The perfect rhubarb slab cake. Perfectly pink to win over any strawberry rhubarb pie lover. In a medium bowl, combine dry ingredients and set aside. In a small bowl combine milk, eggs, vanilla extract, and 1/2 cup rhubarb puree. Whisk together. Add dry ingredients to butter and mix. Add wet ingredients to butter mixture. Whisk until combined. Pour into pan and bake 25 minutes. I did not parchment line my pan since I served my cake from the pan. Instead, I used non-stick baking spray.